It's been a while since we first started our GPS adventure back in February 2008. Back in the early days, the iGPS360 was the only GPS accessory on the market for the iPhone and the iPod touch. The iPad was not on the market yet back then. There was also no App Store in those early days. Now, in 2011, we all have seen big changes over those past few years. We have had the App Store for a number of years now, Apple has allowed third party accessories through their Made for iPod program and the iPad is already on its second generation. Development of GPS accessories has also not come to a standstill. There are various official Apple licensed GPS accessories on the market now. Features, quality and performance varies among them of course. I have done some extensive research and comparisons between most of them and I am happy to hereby endorse Emprum's UltiMate GPS. 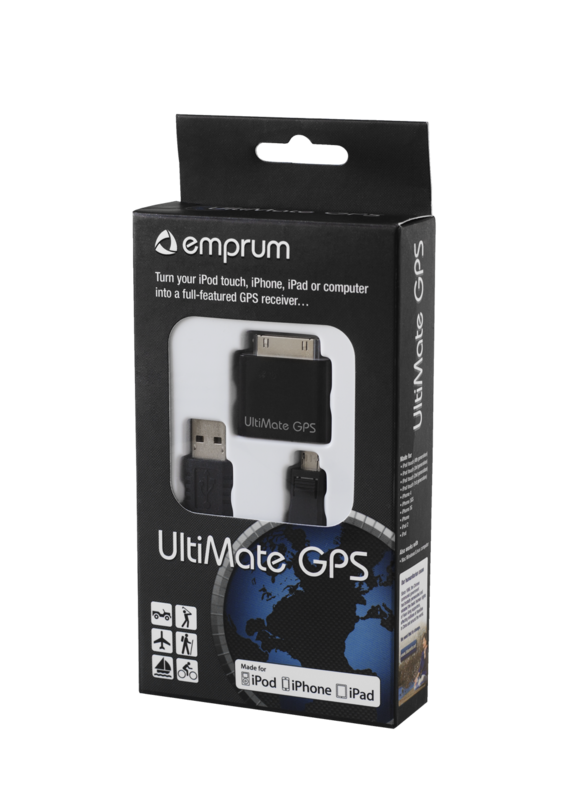 The Emprum UltiMate GPS is a fairly new Apple licensed accessory that has been on the market since August 2011. It is based on the same GPS technology as the iGPS360 is based on: a proven MTK GPS engine that has been on the market for a number of years now and that outperforms most of the newer GPS engines. From my own testing on various newer generation GPS engines and accessories, I have found that they are supposed to have higher sensitivity and faster update rates, but in reality and practice there are a few catches to that. They actually don't perform as well in the real world as the older workhorses. I will dedicate a future post to explaining this in more detail. 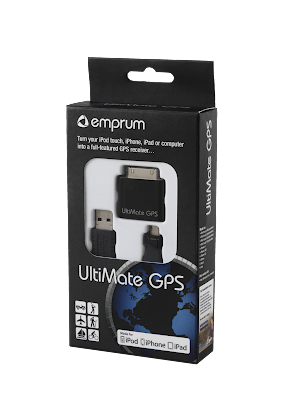 Based on testing and comparing various official Apple GPS accessories on the market, I am hereby endorsing Emprum UltiMate GPS. It is the best unit on the market, not only in terms of GPS performance, it also is an accessory that has many added features, e.g. besides being an accessory for your Apple device, it will also work on a laptop or desktop computer over USB, it comes with a custom USB cable that is rated at 2.1 Amp charging capability required for your iPad, and has easy to read indicator lights that can be customized. Licensed through Apple's Made for iPod program and does not require a jailbreak. Only accessory on the market that communicates GPS data to App Store apps at a 5Hz refresh rate! I have looked at other accessories that claim higher update rates, but they only work at 1Hz with App Store Apps. Emprum's UltiMate GPS accessory is the only accessory that I am aware of that truly updates at 5Hz. Turns your iPod touch, iPhone, iPad or computer into a state-of-the-art GPS receiver. And this is where one added feature lies: the UltiMate GPS also works with your regular computer: desktop or laptop, Mac, Linux or Windows. They all work with the accessory over USB. Use it in your car, on your bike, on your boat or in your plane. Use it for geocaching, hiking, golfing, cycling, running or any other outdoor activity you can think of. Basically any App Store app that has implemented Apple's CoreLocation framework correctly will work with the UltiMate GPS. Comes with the free UltiMate GPS App, available on the App Store, giving you full control of your UltiMate GPS accessory. The UltiMate GPS App is a professional designed app that allows you to interact with your UltiMate GPS. It also provides a GPS satellite signal screen to check your satellites in view and their SNR. Very handy. Works with all location-based iOS apps available on the App Store. Made for iPod touch (1st, 2nd, 3rd, 4th generation), iPhone 4S, iPhone 4, iPhone 3GS, iPhone 3G, iPhone, iPad and iPad 2. Does not require an external power supply. The UltiMate GPS is powered directly by your Apple device or over USB and this can be handy compared to some of the bluetooth units out there whose battery you will need to keep charged separately. This feature list is not complete, so I recommend that for a full product description, you visit Emprum's UltiMate GPS Product Page. If you have had your iGPS360 for a while now and are tired of having to keep jailbreaking your device, we recommend upgrading to Emprum's UltiMate GPS. It is the best unit on the market and follows in the footsteps of the iGPS360. You can place your order for the UltiMate GPS accessory by visiting Emprum's website. Emprum fills and ships orders worldwide, typically same or next day. If you have questions or need additional information on the UltiMate GPS, feel free to ask in the comments and I will do my best to answer them for you. I wish you all the best for the upcoming Holiday Season! Regarding battery usage, it will depend on what device you are using your iGPS360 with. An iPhone should get around 4-5 hours. An iPod touch has a smaller size battery so it will last a bit shorter and the iPad has a much larger battery so it will last much much longer. Regarding an external battery casing, that would require a specific casing for every different Apple device.